In ever changing business dynamics and ever increasing competition, industries are forced to cut that extra fat and are under constant pressure to increase the quality & throughput of the product with minimum work force, reduced capital and operational expenditures. In such a scenario the unplanned shutdown of the plant may even affect the bottom line of the Facility. Some times the cost & production loss due to single, unplanned & unexpected shut down may exceed the annual maintenance budget that was sanctioned. Justification of unplanned & unexpected shutdown is becoming increasingly difficult. To take the full advantage of the production assets & to maximize the value of the investment, the Full Asset availability to the plant is mission critical. By combining the technology of predictive intelligence & the web we can predict the failure of the assets & take proactive actions to prevent the breakdown. We can identify the non-performing/under performing assets, analyze the problem & find out the root causes & solutions to prevent unpredicted failures. The asset portal, utilizes these technology to provide a one stop destination for diagnostic information from all critical plant assets across the Enterprise. The Asset Portal operates on open standard communication protocols such as XML/OPC & is a tool that allows users to capture asset information from a wide range of internal sources and customize how they use that data. Maintenance management personnel can obtain timely information to quickly identify critical equipment that is not performing and can predict unexpected failures or off specification product in time to take corrective action. The Asset-Portal captures events, diagnostics, pre-alarm abnormal condition from disparate data sources such as Condition Monitoring Systems, Instrument Maintenance Management System, Equipment Performance Monitoring Systems etc & displays into formats which aid in critical decision making & monitoring ASSET Condition in a facility. The Asset-Portal can communicate with these data sources on Open protocols like OPC or XML. Asset Portal presents a clear & unified picture of the operating conditions & predictive maintenance information of mechanical equipment, process equipment, field instruments and valves. In addition, Asset Portal provides detailed help information on how to correct problems when they occur and helps in increasing the quality, throughput of the product and increases the availability of the Plant assets & tools. View a snapshot of your enterprise's overall health to aid in determining availability and performance of critical Assets. Summarize the health of assets in a graphical format with an enhanced dashboard. Filter, save, and export data to create reports. Use categorized data to create asset reports and see a clearer view of enterprise health. Poll data sources on demand instead of on a timed basis to get the most current information. Help the plant management in long-term performance monitoring and historical analysis. Improve the Maintenance Efficiency, capture powerful diagnostics and categorized data from your assets in the field and use this information to support decision-making. With the help of the Asset Portal, you can filter data to find the information that is important to you. Then you can export this information for analysis & to reporting tools such as Excel, to identify the assets that perpetually cause problems. You can view the assets from different locations & can give the expert opinion on the problems. The System must provide the means of accessing secure plant asset information throughout the enterprise. The Instrument Maintenance Management System enables users to reduce the time required to troubleshoot, configure, and calibrate field devices through easy access to device diagnostics . The IMMS enables Pro-active & Predictive Maintenance Practices & stream lines Maintenance & Calibration activities in the plant. This will drive towards excellence in maintenance & operational practices & will result in improved plant availability. Instrument Maintenance System should be based on open communication standards. The System must be a single integrated S/W application to perform core functions of device configuration, Calibration Management, Automatic documentation for audit purpose. Predictive & advanced diagnosis of Foundation Field bus, HART & Conventional field instruments and valves. Automatic recording of Configuration changes, Diagnostic Status Changes of Intelligent Devices & Values for the Audit & regulatory purposes. Powerful diagnostics of the intelligent devices so as to conduct advanced analysis and generate alerts for Preventive & Predictive Maintenance. Calibration Management of HART, FF & Conventional devices like defining the Test Schemes, scheduling the calibration of the devices in the plant, downloading / uploading of calibration data to standard calibrators, generating calibration history of the instrument, generating calibration data report with “as left & as found data”, test equipment, cross reference reports. Launch advanced valve performance diagnostics like valve signature, step response analysis, dynamic error band, step analysis, friction test, valve stroke test etc. Instrument Maintenance System should deliver a key value to the “Safety Instrumented System” by extending the time period between proof tests, preventing procedural errors through test automation. IMMS must provide automatic documentation of proof tests for regulatory / statutory requirement. This system can be effectively used to meet many of the requirements of IEC 61511 in safety instrumented system applications. The IMMS must be a non interfering application & should not be a part of safety function. IMMS must include individual login security, automatic audit trail and SNAP-ON diagnostics will allow the user to meet specific safety lifecycle requirements. The Instrument Maintenance Management s/w should have the capability to interface to the Asset-Portal. The IMMS must be based on international standards of inter operability like EDDL to get the long term support & benefits of the investment. EDDL (Electronic Device Description Language) is an international standard & is endorsed by IEC (IEC 61804-3). EDDL is endorsed by the three major digital busses, viz. Improve the bottom line of the operating entity. View all plant asset information in real-time from anywhere. 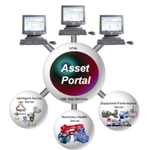 Asset Portal leverages web technology to dramatically simplify the integration of all plant asset information. It provides information, to all levels of the organization, so people can work more efficiently and make better decisions. Asset Portal enables people to see opportunities for improvement and companies to excel.